Shader Utilities Pro (SU Pro) is a tool to create all kinds of shadings within a scene. Part of the tool is a converter, which converts foreign shadings to A&D material. SU offers the possibility of using parameters like AO and Round Corners globally on all shadings. 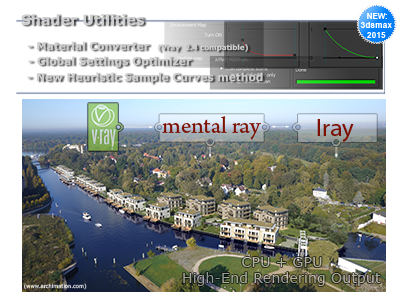 There are 3 selection criteria for doing this: The latest addition is the Sample Curve Technology used to optimize the Sample-Types, AO, Reflection and Refraction globally for an entire scene or all materials. Clients or new Users please send a E-Mail and i send the Shader Utilities Pro Paket to you.